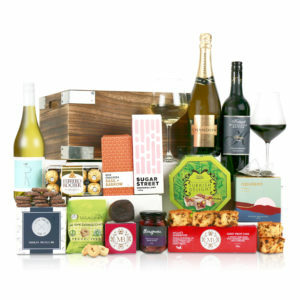 Who doesn’t love a thoughtful hamper? For a slightly different gift-giving option, we offer a range of tempting gourmet presentations. 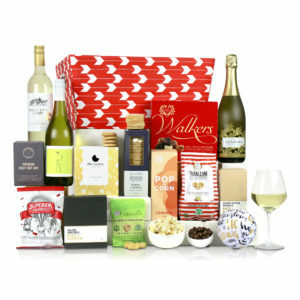 Gourmet hampers are great for helping make the connection between your organisation, and positive memories such as enjoying wine and gourmet treats with friends and family. Imagine – your brand name and/or logo on a cooler bag or picnic basket, being enjoyed by a VIP client or colleague. It certainly beats boring greeting cards and promotional merchandise! Hampers are a perennial favourite and can be personalised to your requirements. 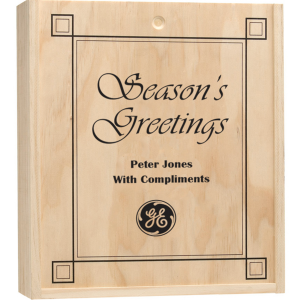 This makes them suitable for a wide range of different occasions – not just Christmas. 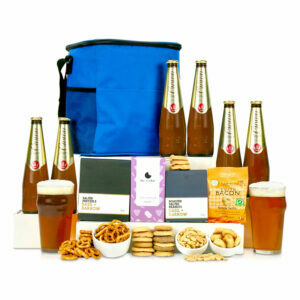 Corporate hampers are a great way to celebrate a special achievement or milestone such as a company anniversary. If you’ve recently launched a new look with a new logo, you could have it printed on a quality cooler bag for your VIP clients to enjoy. Although we can’t guarantee all the delicious treats will last long, this is a great way of keeping your brand in front of the people who matter. For chocoholics our Celebrate Chocolates are a mouth-watering option, as is our Irish Cream Chocolate Sauce (which looks even more tempting when customised!). For Christmas-time gifts, why not consider our Christmas hampers? For a savoury touch try our Olive Oil & Balsamic Vinegar and Salt & Pepper presentation sets or our Barbecue Gift Box. We have dozens of different designs to choose from; wonderfully eclectic collections of favourites and hard-to-find brands you won’t find anywhere else. Click the button below to see them all. You can even get custom printed ribbon, for the perfect finishing touch. Many of our hampers include premium wines. 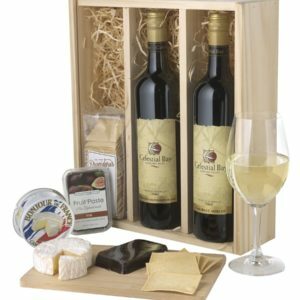 If you’re looking for gourmet wine hampers with wine and glassware only, browse our prestige wine gifts selection. Can’t see precisely what you’re looking for? We also offer custom options. Get in touch online or call (03) 9484 9829 to discuss your needs and preferences. Can’t see precisely what you’re looking for? We also offer custom options for businesses across Australia. From Melbourne to Perth, your business can offer commemorative gifts to all your clients or employees. Get in touch online or call (03) 9484 9829 to discuss your needs and preferences. Download our 2017 Gourmet Hampers Range here.